I want to be somewhere warm. Every year in January, I start dreaming of sun and beaches and water. I envision a long walk on a beach, my feet sinking in the warm sand as I collect rocks and shells. I’m not sure why I’m drawn to areas where land meets water but the ocean feeds my soul in some way. I love my life in Atlanta, but I do wish our city was closer to water. Growing up in Mississippi, the Gulf Coast of Florida served as a regular vacation destination for my family. The white sandy beaches juxtaposed to incredibly clear blue-green water make for some of the world’s most beautiful coastlines. I’m a little like Pavlov’s dog when I hear the word “seafood”. I really do begin to salivate in anticipation of eating something fresh out of the water. In Destin, Florida, Sexton’s Seafood sells some of the freshest seafood I’ve ever consumed. They operate their own boats and what you see in the market was literally caught just hours before. Whenever we’re the area, I shop at Sexton’s for pounds of jumbo shrimp, red snapper, and crab and prepare what I call a “Seafood Fantasy”. When seafood is that fresh, the less you do to it the better. Butter, lemons, and garlic are all you need to make a delicious fête de la mer. Dreams of beaches and seafood led me to this post and a soup with one of my favorite things: crabmeat. Crabmeat may be a little bit of a splurge, but in the cold months of winter, it provided me just the escape that I needed to warm days by the sea. 1. Brown bacon in a large dutch oven or stock pot. Remove bacon and set aside. 2. Transfer onion to the pot and saute for 3 to 4 minutes. Add garlic and continue sauteing for 1 minute. Add potatoes, salt, pepper, red pepper flakes, and thyme. Stir to combine. 3. Add tomatoes and chicken stock and bring to a boil. Reduce heat, cover and simmer for 10 minutes or until potatoes are tender. 4. Add coconut milk, stirring to combine. Add spinach and continue cooking until wilted. Immediately before serving, add crabmeat and stir gently so you don't break up the lumps. Serve immediately with scallions, reserved bacon, and lime wedges. Oh, this soup does look like warm weather to me! Which I’m craving at the moment. 😉 Lovely flavors, terrific recipe – thanks. That looks delish!! I love coconut and crab, can’t wait to try it. Thanks, Debra! I appreciate the comment and the visit! I am so with you about needing a break from this winter already, and we have months to go up here in Vermont. This soup is absolutely stunning! Pinned… Twice! I so wanna be somewhere warm too – even though we don’t have it as bad as others in the Central and northern states do. 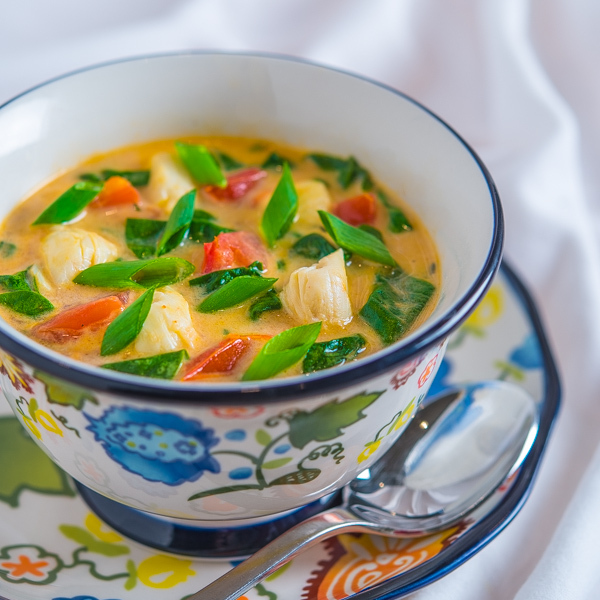 Love your addition of bacon into this crab soup – it looks so soul warming! The bacon does kind of make the soup! 🙂 Thanks, Shashi! For those of us who taken a blood thinner & are diabetic, do you have any recipe alterations or another food site that addresses these food health concerns? This looks wonderful but 5 cups of spinach is a problem as it is very high in Vit K. Any ideas for us? Thanks! Love this site! Hi Bert, thanks for your question. This soup can be altered in a number of ways and will still be delicious. One solution is to cut way back on the spinach, maybe 2 cups? You could also substitute other vegetables such as asparagus or even the green part of leeks. I would suggest playing with the recipe and try any vegetable that you like…carrots, broccoli, green beans, etc. Let me know how it works out. oh what I would give to have access to such fresh seafood. I can find some fresh seafood but to buy it, I’d have to put back those bottles of wine. 🙂 Your soup if quite different from anything I make, but definitely a soup I would love to eat! Looks yummy! The gulf coast has not been too warm lately 🙂 This is a beautiful bowl of seafood wonder…The colors, textures and flavors are really nice. Cheers to long walks on the beach! Great food and family and friends. Thanks so much for dropping by, Velva! This soup looks so incredible! I want a bowl right now!!! Absolutely lovely soup! I also wish Atlanta had fresh fish available like coastal cities. Even what is found at markets isn’t quite like right off the boat freshness. Thank you so much, Renee. Hope to see you at FoodBlogSouth!